Many business premises are beautifully presented and welcoming on the inside but lack the same kind of flare and appeal on the outside. First impressions count. The presentation at the entrance of your place of business is one of the most important things to get right in order to welcome new customers and put your employees in the right frame of mind. 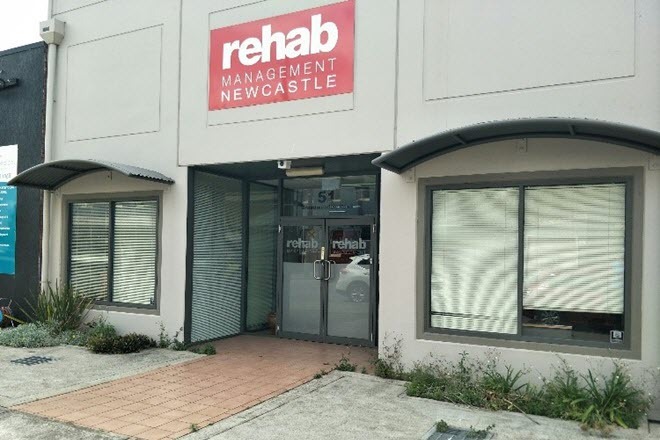 Belinda from Rapid Solutions knew she needed to do something to improve the entrance to herbusiness, but she didn’t have the knowledge or time to do it herself. She asked Street Appeal Garden Solutions to help. The process we conducted could be applied to many situations. 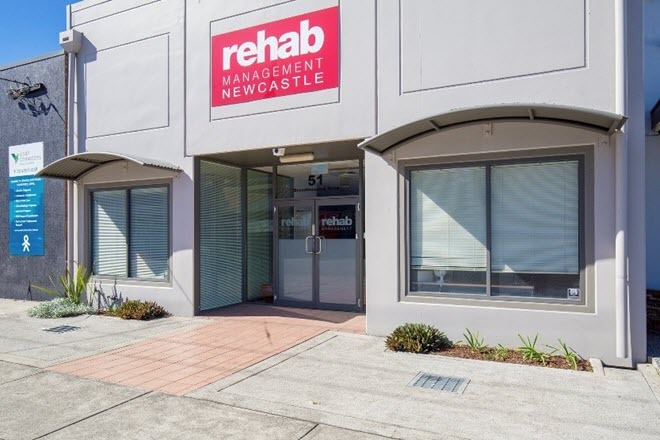 Rapid Solutions is a thriving business in Broadmeadow which moved to the current site in 2017. The 12m long raised garden bed frontage is shared with the business next door. Inside the Rapid Solutions office is fresh, modern and comfortable. However, looking out the windows, all that the employees and customers could see were overgrown, cut off, brown-tinged yuccas. 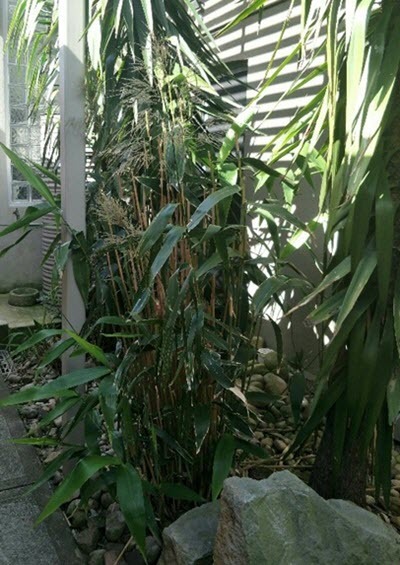 It was impossible for employees and clients to ignore the ugly garden as they entered the building. 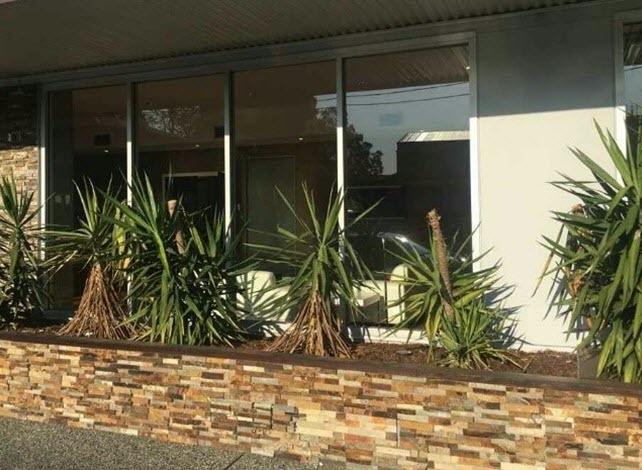 Not only did these plants look bad, they were starting to put pressure on the garden edging causing some of the façade to break off! 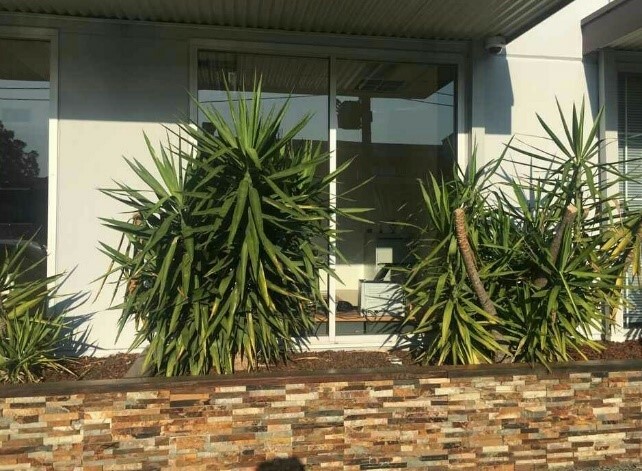 The Yuccas were only going to get bigger and uglier, so they needed to go! An arborist was required to remove the bulk of the existing plant material. New plants were introduced followed by a 5cm layer of pine bark mulch. 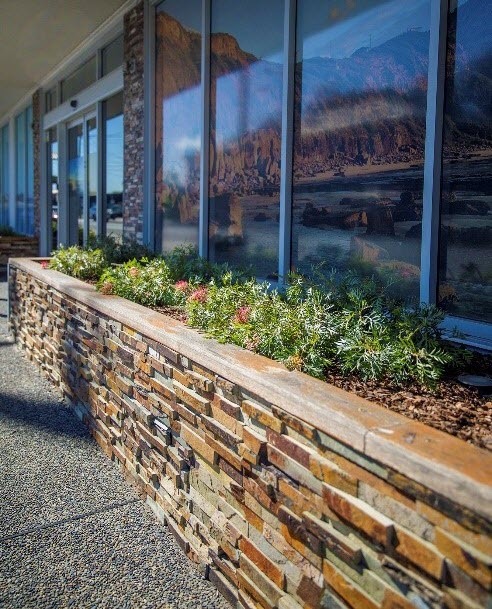 The combination of low growing, flowering grevilleas and the stunning window feature has taken the exterior of Rapid Solutions from a deterrent to an absolute draw card for this place of business. 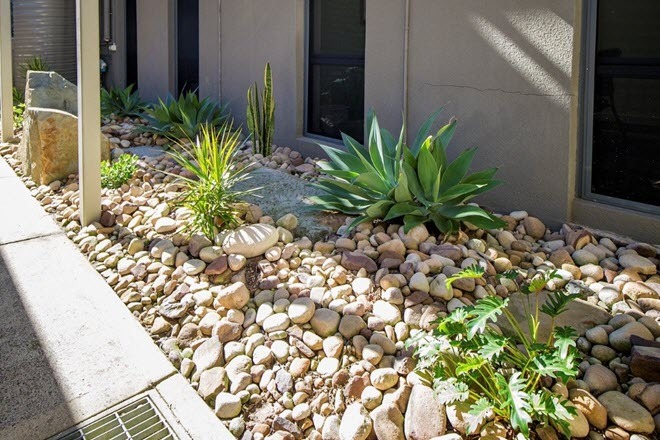 “The result is a low maintenance, highly appealing garden with flowering natives that not only increase our street presence, but our employees love tending to as well.” – Belinda, Rapid Solutions. 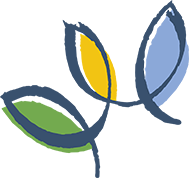 If you have customers attending your business premises for appointments, meetings or conferences, then it is vital you give a positive first impression. A raised garden bed provides the opportunity for a low maintenance garden. Pots can look great but will dry out more quickly so require more regular watering. 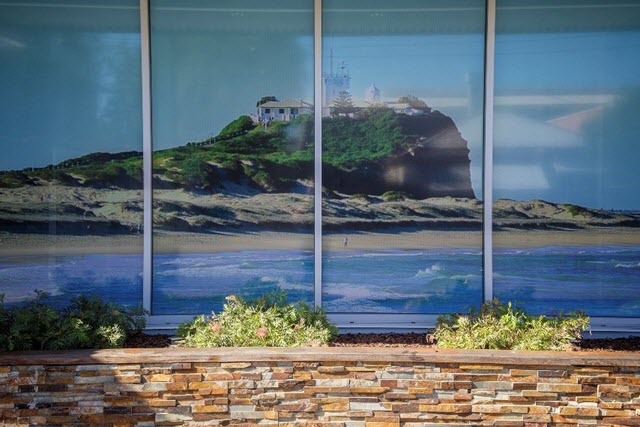 Here’s what to do with the garden at the front of your business premises…..
1. Weed…Pull weeds out! Weeds and the plants you actually want ultimately can͛t live together. The weeds will take all of the water and nutrients, depleting the plants of what they need. Once weeded, use a salt and vinegar spray to kill new shoots. 2. Prune…Most plants like a haircut every know and then. After flowering is a good time for a trim. Try to prune plants just above new shoots. 3. 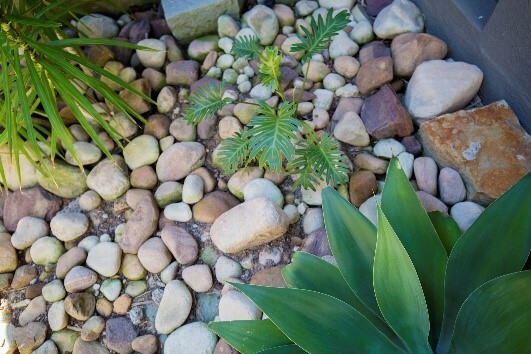 Plant…Some examples of tough plants for sunny spots are Grevillea, Gardenia, Liriope and various succulents. Tough plants for shady spots include Philodendron ͚Xanadu͛, Liriope ͚Elmarco͛and Hydrangeas. Make sure you improve the soil with some manure or compost before planting. 4. Mulch…Mulch improves soil, suppresses weeds and holds in moisture. We recommend a fine pine bark for a low maintenance garden and sugar cane mulch for a more delicate garden. 5. Water…Water your garden at least once per week. The plants suggested will survive without much water, but most plants will thrive with a regular drink (don͛t we all!) If you know you won͛t water, you can put together a basic watering system fairly cheaply to get your plants through the summer months.